I have another food review in the beautiful place of Myrtle Beach. I told you all this is a little hidden city of foodie spots. 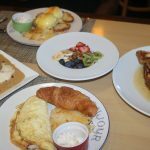 I could not leave Myrtle Beach without looking for a brunch spot, and Croissants Bistro and Bakery did not disappoint. 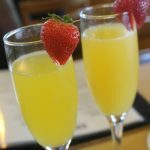 In actuality, Crossiants is the only full serve brunch specialty spot in the Myrtle Beach area. Its a chic little spot that blends southern charm with a little of a French flair. Their trademark greeting in this place is “Bonjour Yall”, in which the owner Heidi coined and also named the title of her award winning cookbook. First up was drinks! 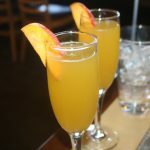 I couldn’t have a brunch without mimosas, but they also suggested Peach Bellinis too. Hey why not? If you like omelettes, this one was absolutely delicious. This seaside omlette was stuff with lots of fresh shrimp and literally I finished it all in one sitting. It was so good! I’ve had lots of shrimp and grits as a staple dish for brunch in the past, but hands down this was the best I have ever tasted! I think what kicked this dish up a notch was the fried green tomatoes that was placed between the actual grits and shrimp. Definitely a great southern dish, and I will drive all the way up to Myrtle Beach just to come back for this alone. I am serious. 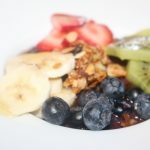 This is a must order for brunch! Between my friend and I, we had an amazing brunch spread. This is not a standard brunch, it felt like we were eating a 5-star upscale meal that happened to between breakfast and dinner. The presentation of the meals were amazing and I am telling you, all of the dishes were top notch. I dare even say that this brunch might even triumph what I am eating in my own hometown. 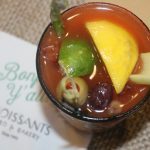 One of the features that makes Croissants special is they have a DIY Bloody Mary Bar. I will be honest I had no interest in it initially until my guest started getting excited about it. I said why not try it since they did have an array of ingredients and flavors to make your own unique Bloody Mary drink. 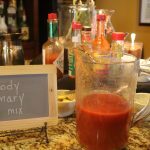 So many hot sauces, spices, bacon flavors, asparagus, celery, jalapenos, difference olives, and more to add into your own bloody mary. You can choose between Tomato Juice or Bloody Mix as well. It was really fun to make, I actually go really into it, and if I do say so myself I mad an excellent batch of Bloody Mary. I promise now I think this make me love Bloody Marys now. But what helped is that all the ingredients were fresh and I could make it myself. I probably wont get another one like this somewhere else unless they provided a DIY like this. It was really good! 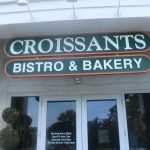 Croissants is an amazing brunch spot in Myrtle Beach and I am happy I stopped by to taste for myself before I left. 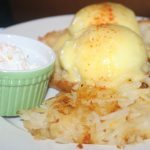 It took all of my favorite brunch items and took it to another level with flavor and southern charm. 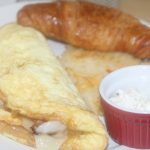 Croissants also serves dinner and specializes in homemade custom baked goods too. Its an award winning bakery since 1995 with freshly baked breads, muffins, cookies, cakes, and pies daily. Croissants is branded with the “SC Fresh on the Menu” seal, they are committed to preparing and serving fresh local vegetables, fruits, seafood and meats through close relationships with SC’s farmers and fishermen. 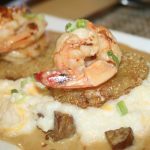 This S.C. Fresh on the Menu Myrtle Beach Restaurant has been welcoming guests for nearly 20 years serving Fresh Seafood and Steak Dishes in a Casual Fine Dining atmosphere. 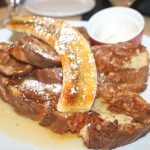 So if you are a brunch person like myself, do not leave Myrtle Beach without trying this place out. You will not have a brunch dining experience like this elsewhere in the city. Crossiants you have definitely won me and my brunch taste buds over.